When was "computer" first mentioned in the New York Times? It’s kind of fun to read through the New York Times’ historical archive and read what the tech coverage back in 1851 – a recent gem posted on HN concerned the controversy behind Thomas Edison’s 141-question job interview (‘Where do we get borax from?‘). I was looking up some computer history and was wondering when the word “computer” made its first appearance in the Grey Lady. The NYT’s archive search allows for some fuzziness, so “computer” brings up numerous articles with “compute” and “computed” – as in, to calculate. I didn’t search through every individual article, as the old articles are still in PDF form. 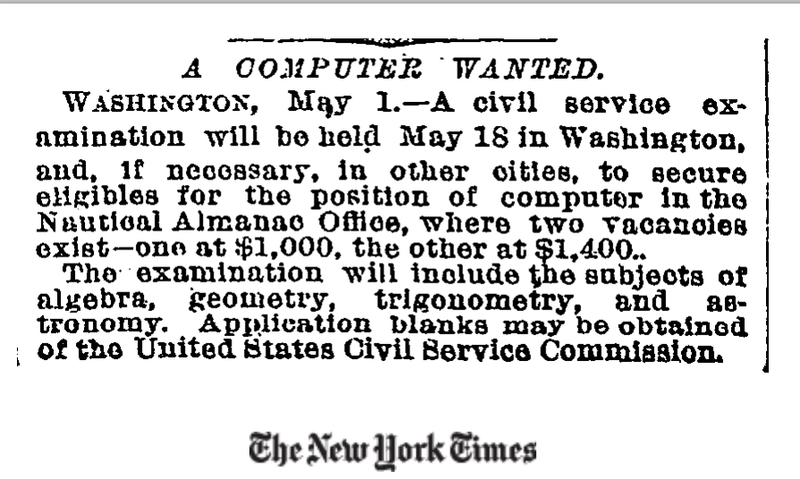 But I think May 2, 1892 (the job posting says May 1), may at least be the first time the word “computer” shows up in a NYT headline (PDF). WASHINGTON, May 1. – A civil service examination will be held May 18 in Washington, and, if necessary, in other cities, to secure eligibles for the position of computer in the Nautical Almanac Office, where two vacancies exist – one at $1,000, the other at $1,400. The examination will include the subjects of algebra, geometry, trigonometry, and astronomy. Application blanks may be obtained of the United States Civil Service Commission. FYI, according to this inflation calculator, $1,000 in 1892 is equivalent to about $24,650 today. Again, the “to calculate” meaning is implied here, with the applicant expected to help compile the used by the U.S. Navy for celestial navigation. The almanac office is still in existence (as a part of the U.S. Naval Observatory) and you can still purchase your own copy of the almanac, which includes “the following data tabulated at hourly intervals to a precision of 0.1 arcminute: the Greenwich hour angle and declination of the Sun, Moon, and navigational planets; the Greenwich hour angle of Aries” and more. It wouldn’t be surprising, though, to see “computer” as machine referred to in the 19th century. The concept of a calculating machine dates back to the English mathematician and engineer, Charles Babbage, though his “Difference engine” was never built during his lifetime. In 1812 [Charles Babbage] was sitting in his rooms in the Analytical Society looking at a table of logarithms, which he knew to be full of mistakes, when the idea occurred to him of computing all tabular functions by machinery. The French government had produced several tables by a new method. Three or four of their mathematicians decided how to compute the tables, half a dozen more broke down the operations into simple stages, and the work itself, which was restricted to addition and subtraction, was done by eighty [human] computers who knew only these two arithmetical processes. Here, for the first time, mass production was applied to arithmetic, and Babbage was seized by the idea that the labours of the unskilled computers could be taken over completely by machinery which would be quicker and more reliable. Every light house would have its own number, which would be continually repeated, either by light or sound, as long as necessary. Thus, if the light-house was numbered 73, there would be during foggy weather seven blasts at short intervals, then a pause: then three blasts, and a longer pause; after which the same would be repeated as long as the fog lasted. The number of the light-house could be given in 30 seconds. As the light-houses on either side would be arranged with numbers not having the same digits, (say, for example, 25 and 48,) the counting of one digit would in most cases indicate the light-house and the counting of the second would afford a check and give positive assurance of the correctness of the observation if it was found to tally with the number found on the chart. In this system nothing else has to be done beyond counting the number of the blasts; no special training is required, and a glance at the chart tells everything wanted. Surely this is within the intellect of almost any sailor of any nation. If you read the rest of that Scientific Gossip column, it seems that the audience of 1881 had more patience than the audience of today for verbose technical explanations. This entry was posted in thoughts on February 18, 2013 by Dan.